Every presentation is a performance, and Benjamin Zander knows a thing or two about the art of performance. As Dan Pink and I were riding the train back to central Osaka a couple of weeks ago he tipped me off to Ben Zander. There are a lot of good presenters, Dan said, but Ben Zander is one of those gifted few who is in another league. 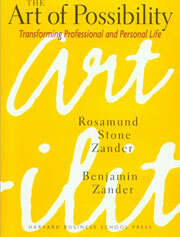 I just finished reading The Art of Possibility by Ben Zander and his wife Roz Zander and I’m inspired. The suggestion to checkout Ben Zander was the best tip I have received in a very long time. There are too many good lessons in this book to go through all of them here, but allow me to focus on just a few as they relate to presentations, leadership, and communication in general. In most cultures — and certainly here in Japan — making a mistake is the worst thing you can do. Zander says that it’s dangerous for musicians, for example, to be so concerned with competition and measuring themselves against others because this makes it “difficult to take the necessary risk with themselves to be come great performers.” However, only through mistakes can we see where we’re lacking, where we need to work. But we hate mistakes so we play it safe. Yet long term nothing could be more dangerous if our goal is to be insanely great at what we do. Zander suggests that instead of getting so dejected by mistakes, we instead exclaim loudly (or to ourselves) “How fascinating!” every time we make a mistake. This little gem alone was worth the price of the book. Think about that. Another mistake? How fascinating! Another opportunity to learn something just presented itself. Another unlucky break? No worries! Move forward. Rather than getting bogged down in a sea of measurement where you compare yourself to others and worry about whether you are worthy to be making the presentation or whether someone else could be doing it better, instead realize that at this moment in time — right here right now — you are the gift and your message is the contribution. There is no "better," there is only now. Vanity and tyrannical management styles are not uncommon among conductors even today, Zander says, which is perhaps one reason why in at least one survey orchestral players rank only slightly above prison guards in job satisfaction. The truly great conductors, says Zander, are like any other great leader, they understand that their true power “derives from [their] ability to make others powerful.” The question to ask, then, is not “How good am I?” but “What makes [this] group lively and engaged?” It is not about gaining sway over your group (or audience or class) so that they will play it the way you envision — or see things your way — but rather the question now becomes how best to enable them to play it beautifully the way they are capable. In presenting — and certainly in teaching — we need to make certain that the audience is engaged so that they may, with our help, find for themselves what is there to be discovered, including the discovery of the possibilities that may be within them. Don’t take yourself so g—damn seriously! “Lighten up,” Says Zander, “and you lighten up those around you.” This is not to suggest that you shouldn’t take your work seriously (you should), or even that you shouldn’t take yourself seriously (that may depend on time and place), but for absolute certainty we must all get over ourselves. There is perhaps no better way to “get over ourselves” than the use of humor. 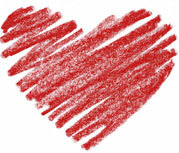 From birth we are concerned about measurement and worried about perceived scarcity of love, attention, food, etc. that seems to be the way of the world. Zander calls this the "calculating self," and in this environment of scarcity, competition, and comparison “the self needs to be taken very seriously indeed.” No matter how successful and confident we may become as adults, our “calculating self” (concerned with measurement and worried about scarcity) is weak and sees itself at risk of losing everything. No wonder the calculating self is concerned with “looking out for number one” and takes itself so g—damn seriously. It is not enough to know a piece of music intellectually or to play it without any mistakes, you have to convey the true language of the music emotionally, says Zander. When musicians truly get into the music and play it with such heart and emotion that audiences are moved beyond words, Zander noticed that the music was flowing through the musicians, taking control of their bodies as they swayed from side to side. Zander, then, urges musicians to become “one-buttock players,” that is to let the music flow through their bodies, causing them to lean and to move from one buttock to the other. If you’re a musician, or making a performance of virtually any kind, and you are totally in the moment and connecting with the language of the music and the audience, there is no way you can be a “two-buttock player.” You’ve got to move, you’ve got to connect, and you must not hold back your passion but instead let the audience have a taste of the commitment, energy, and passion you have for the music (or the topic, the ideas, etc.). This quote below from Martha Graham captures the essence of the idea of giving way to passion (from page 116 of The Art of Possibility). I think you can apply these words to the art of performance or presentation, and frankly to life in general including leadership, entrepreneurship, etc. • Watch video of Zander on the Big Speak page (upper right column). I’ll be in Tokyo next week, Tuesday - Thursday (May 29-31). I tell you this just in case you happen to be in Tokyo (or have friends there) as I’ll be making a presentation on the evening of May 29 in Roppongi Hills (Roppongi Hills Mori Tower, 23rd floor) that is open to the public. The presentation is sponsored by the Foreign Women Lawyers’ Association (Tokyo). Men and women from outside the organization may sign-up (¥5000 for non-members, ¥2000 for students; a light dinner will be served). Learn details of the event here. 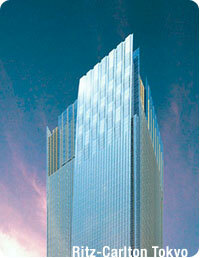 Besides holding one private seminar and giving a public presentation, there are two other reasons I will be in Tokyo. First, I’m researching “presentation” in the broader sense for a book, including the presentation of “brand” at its myriad touch points in businesses such as luxury hotels among others. 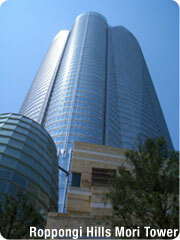 To this end I have arranged to stay one night at the Grand Hyatt in Roppongi Hills and one night at the nearby Ritz-Carlton. Both are five-star hotels and obviously not usually the kind of places a cheapskate like me stays when on the road, but this is research so it’s got to be done. The second reason I’m heading to Tokyo (besides the presentations) is that I will be attending my first Pecha Kucha event (what's that?). I have been meaning to write about this presentation style and international phenomenon since I started the blog over two years ago. Proof positive that I am as good at procrastinating as anyone. 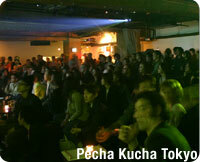 The Pecha Kucha event is held Weds May 30 from 7:00pm at Superdeluxe in Roppongi, a very cool multimedia event space (about the space). My schedule is filling up for the three days, but If you happen to be in the Ropponi Hills area perhaps we can grab a cup of coffee and a chat. Otherwise I look forward to seeing many of you there Tuesday night for my presentation or at Pecha Kucha on Wednesday (I’m not presenting, just there to learn and take it all in). So there I was in the Osaka Hilton having lunch with my wife and author Dan Pink when I realize (again) that the world is indeed small, and blogging is making it even smaller. Dan Pink’s last “real job” was as chief speech writer to Vice President Al Gore in the ’90s. I have not met Al Gore but I’m buddies with Duarte Design and of course Al Gore is good pals with the folks at Duarte, the design firm that creates his famous Keynote slide presentations. 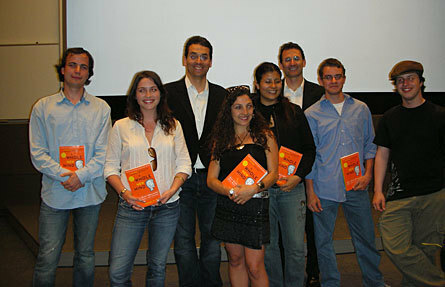 I got to know both Nancy Duarte and Dan Pink initially through my blog. Talk about six degrees of separation, today it often feels more like two or three. Blogging shrinks the globe. Anyway, I had the pleasure last week of spending about eight hours with Dan Pink, author of two best-selling books: Free Agent Nation and A Whole New Mind. A Whole New Mind is my favorite book of 2006. It’s brilliant and absolutely spot on. Dan is over here in Japan on a Japan Society fellowship studying Manga (among other things) for a couple of months. I learned a few things about Dan Pink during his visit with me. I already knew he was a great writer, but what I learned is that he is a fantastic speaker. And…he’s a mensch. A mensch is a Yiddish word roughly meaning “good person with admirable characteristics, etc.” A mensch to me is the kind of person who returns to the department store when he discovers he was given too much change, or the kind of person who calls a foul on himself in a pickup game of basketball. You get the idea. Dan Pink is a very busy man, and due to his impressive background and success he certainly commands high speaking fees, yet he took the time to join me in schlepping out to Kansai Gaidai University, located between Kyoto and Osaka, to speak for free to about 150 college students from around the world who are studying in Japan. Not a glamorous gig perhaps, but Dan accepted the speaking engagement with grace and enthusiasm, demonstrating to me that he’s a total mensch and that he also gets the whole “pooping like an elephant” thing (if that last part makes no sense to you then read this PZ post on “giving it away”). Also see this post by Guy Kawasaki (another mensch who has helped me in the past) called How to Be a Mensch. Not all good speakers are good writers, nor are all talented writers necessarily good public speakers, but Dan Pink has both of these skills down cold. Dan is a fantastic writer, of course, contributing to the New York Times, Fast Company, Harvard Business Review, Wired, and many others in addition to his best-selling books. But I was pleasantly surprised to find that he is an amazing speaker. He’s exceptionally good. In fact I was blown away. He’s dynamic, enthusiastic, and totally engaged with his audience, but he’s not too polished or slick. He was perfectly imperfect. He was human. He may have a good background in politics, but unlike most politicians, he gives you depth and breadth without the veneer of “a slick talker.” He is charismatic and funny, but he brings serious content and the spirit of a concerned teacher to the stage. 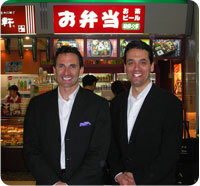 Dan Pink in Japan: Casual, conversational, and always in front of the podium. Kansai Gaidai students line up to get a picture with Dan Pink. 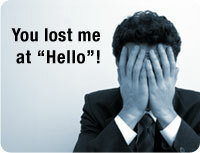 Seth Godin is absolutely right when he says presentations are about the transfer of emotion not just facts. Facts are a necessary condition, but they are rarely sufficient. If it were only about facts, we could just send an email and cancel most presentations. If it were only about information, we could read it in a book. But ideas — especially ideas that change things, that move things forward — usually have more impact when the originator of that idea conveys the message via the spoken word even though the same ideas may be widely published in a journal or in the author’s book, etc. The reason, in part, is emotion. Live is best, but even recorded presentations can add emotion and a new dynamic to content you may already be familiar with. 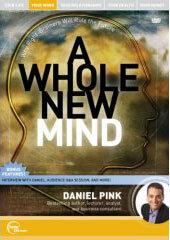 Dan Pink’s DVD, also called A Whole New Mind, is a good example. The content of what he says in this presentation recorded in front of a live studio audience is essentially the same as what is in the book, except that he can not go into nearly as much depth in a 50-minute talk as he can in a 250-page book. Yet hearing the author repeat his message in a recorded presentation (and then again live in Japan) made his ideas somehow more memorable, more real, and very importantly, I felt a greater sense of inspiration and urgency to take action. 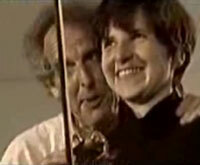 Above, watch a sample from the A Whole New Mind DVD. The DVD starts with a short interview with Dan followed by a live presentation and a Q&A session with the audience. The clip above gives you a feel for the content. Well worth the money. 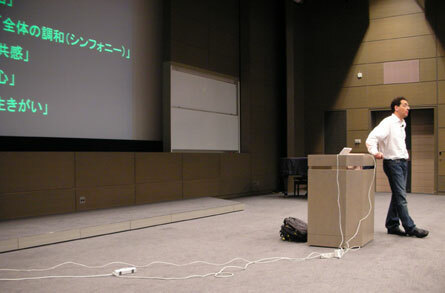 At Kansai Gaidai University Dan did one of the best jobs with an informal Q&A session that I’d ever seen. He gave away one of his books to every student who asked a question. The demand for free books quickly exceeded supply as the international audience of students and professors was eager to ask questions after his provocative talk. This kind of student involvement is not easy to garner in Japan, even among international students. Dan would make a great teacher. He scores very high for the six important aptitudes in the conceptual age — design, story, symphony, empathy, play, and meaning — aptitudes that make for great teachers and great communicators in virtually any field. Two Questions: Why does it matter? What's your contribution? A lot of the presentations I attend feature a person from a specialized field giving a talk — usually with the help of PowerPoint — to an audience of business people and creatives, etc. who are not at all specialists in the presenter’s technical field. This is not an uncommon type of situation, of course. For example, an expert in the area of, say, biofuel technology may be invited to give a presentation to a local chamber of commerce about the topic and about what their company does, what the average person can do, etc. Recently I attended such an event, and after the hour talk was over I realized that the presentation was a miracle of sorts: Until that day I didn’t think it was possible to actually listen to someone make a PowerPoint presentation in my native language of English and for me to genuinely not understand a single point that was made. Not one. Nada. I understood the individual words, the pronunciation and diction were perfect, but between ubiquitous acronyms — and the darting laser pointer used to underline those acronyms — bulleted lists, and colourfully decorated charts and diagrams, after it was all said and done, I realized that I hadn’t comprehended a single idea. I wanted my hour back. The wasted hour was not the fault of PowerPoint or even bad slides, however. While I was suffering through this, doing the best that I could to understand, it occurred to me that this presentation would have been greatly improved if the presenter would have kept two good pieces of advice in mind in preparing for the talk. These two bits of advice which I discovered recently have nothing to do with PowerPoint or the art of slide presentations per se, yet they apply well. I mentioned before that I think Brand Gap is one of the best little books on branding that I have ever read. Even people who loathe the very idea of marketing or branding will find something useful in this book. In Brand Gap author Marty Neumeir (read an interview with the author) tells us of a consultant who starts off every meeting with a new client the same way, by asking these three simple questions: Who are you? What do you do? Why does it matter? Sounds simple, and people usually do pretty well with the first one and even the second one, but the third one — why does it (or you) matter? — whoa, this is where people stumble. Yet, that is what people (including most audiences) are hoping and praying that you’ll tell them. Neumeir says that these three questions together provide the litmus test for what makes us different or what gives our company it’s raison d’etre. Neumeir may be talking about branding, but his advice here translates well to other forms of communication as well. 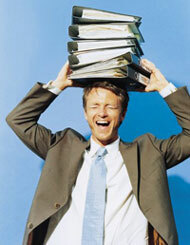 We can, more or less, read about what you do and who you are, but why it matters? Why we should care? That’s going to take persuasion, emotion, and empathy. Empathy in the sense that the presenter understands that not everyone will see what to him is obvious or that others may understand well but not see why it should matter to them. Good presenters try to put themselves in the shoes of the audience so to speak. If you have never been in a presentation or a meeting and not asked yourself “why does this matter?” — or “why am I here?” — then you are a very lucky person indeed. Failing to answer the question “Why does it matter?” — or “What’s in it for them (the audience)?” — is often at the heart of a failed presentation. 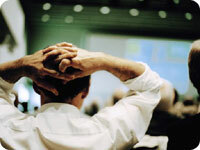 Not every presentation situation is about contribution, perhaps, but most are. Certainly when we are asked to share our expertise with a group who are on the whole not specialists in our field, we have to think very hard about what is important (for them) and what is not (again, for them). It is easier just to do the same presentation we always do, but it is not about impressing people with the depths of our knowledge, it’s about sharing something of lasting value. When assessing presenters, then, you may want to measure them against these four question (among others): Who are you? What do you do? Why does it matter to us? What did you contribute? If these answers are clear and the contribution was beyond expectation, then chances are the hour was not a wasted one. • Ben Zander wisdom (very short YouTube clip). Who says we need our logo on every slide? “Brand” is one of the most overused and misunderstood terms in use today. “Branding” is perhaps even more misunderstood. 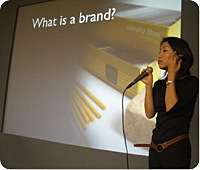 Many people confuse the myriad elements of brand identity with brand or branding. PowerPoint critic Edward Tufte, for example, has referred to the simple (and admittedly annoying) act of placing logos on every PowerPoint slide as “branding,” implying that branding doesn’t go much deeper than catchphrases and identity symbols. A logo, though, is but one visual symbol of a brand. The logo is an important part of the outward expression of a brand (part of brand identity), but the meaning of brand and branding goes far, far deeper than simply making one’s logo as recognizable as possible. Though logo placement itself is not branding, I do share Tufte’s distain for logos/trademarks appearing on every slide of a presentation. If you are presenting for an organization try removing logos (and other clutter) from all except the first and last slide. If you want people to learn something and remember you, then make a good, honest presentation. The logo won’t help make a sell or make a point, but the clutter it brings does add unnecessary noise and makes the presentation visuals look like a commercial. And people hate commercials or being sold to. We don’t begin every new sentence in a conversation by re-stating our name, why do we bombard people with our company logo in every slide? Organizations, then, should worry less about advertising and spend more effort in making insanely great products and services that are worth talking about. That is, they should show us (prove to us) how great they are rather than just telling us how great they are through expensive media buys, and placing their identity graphics in every conceivable place, including PowerPoint slides. No wonder logos and other visual brand identifiers have gotten such a bad rap. Just look around you. Perhaps the worst offenders of putting “branding” (using the term in the most superficial and largely incorrect sense here) and logo placement ahead of actual content are the cable news programs. For example, here is an interview (below) on The O’Reilly Factor (Fox News) with the program host Bill O’Reilly and guest Richard Dawkins. Dawkins is an Oxford professor and the author of The God Delusion. He is a very famous author in the world these days and a very popular speaker. Dawkins spoke at TED a couple of years ago (see video of TED presentation). Presumably, if you fly a bestselling author like Richard Dawkins to your show and want to discuss such a deep, complicated issue you would allot more than four minutes and forty seconds for the interview. And if your were necessarily limited to such a short segment surely you would like the guest to get a chance to do most of the talking. If the host’s objective was to get a better understanding of the guest’s ideas and arguments and allow the viewers to see those arguments then we’d have to conclude that the interview was a failure. In fact the host spoke about 75% of the time. If the goal was to promote the host and his show (and presumably sell more ads) then we can conclude that the interview was a success. At no point during the 4:40 interview did you not see either Bill O’Reilly’s face or his name displayed in three large signs hovering around the guest. Why not just have guests wear Bill O’Reilly sandwich boards or at least “Factor” T-shirts? 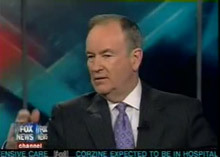 By placing guests between two large “O’Reilly Factor” signs (above) they have introduced visual elements that do not help viewers better understand the guest speaker; they have cluttered the display and turned it into a commercial. Obviously this was no accident. 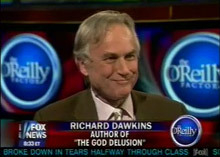 According to the design principle of Ockham’s Razor if we have two functionally equivalent displays — such as the display of Bill O’Reilly (right) and Richard Dawkins (left) on the TV screen — we should select the display with the fewest visual elements. One would assume that the intended function of the displays is to provide an aesthetically pleasing setting for presenters to appear and have their words heard and understood without visual distraction. But if the function of the displays (including backgrounds) are equivalent, then why not frame both presenters in displays with the fewest extraneous visual elements? Which presenter above appears in the display with the fewest visual elements? In this interview (below) on CNN with Paula Zahn, Richard Dawkins gets more of an opportunity to make his case. This time Dawkins spoke for about 75% of the time. This may be a better (albeit far too short) interview compared to The Factor appearance, but CNN largely suffers from same fluff and promotion-over-content problems seen in the other cable news networks. Moreover, the first time CNN’s Paula Zahn moderated a discussion about atheists and discrimination in America in January of this year, they neglected to put an atheists on the panel. Not good journalism, perhaps, but the set looked fantastic! One of my favourite comedians is Lewis Black. Below watch this short clip of him appearing on CNN and getting fed up with the extraneous graphics on the display. See Cleaning up our act, a post I published on August 20th last year for more on the issue of on-screen clutter. You can also see the full Lewis Black interview there. We learn bad habits from many places. How many people still put two spaces after a period, for example (an old habit left over from the era of the typewriter)? I'm not sure where we learned that putting logos and other superfluous elements on every slide was a good idea; perhaps the slide master in PowerPoint made it too easy. Most companies with a PowerPoint template certainly insist that their employees use the company logo on every slide. But is this good advice? 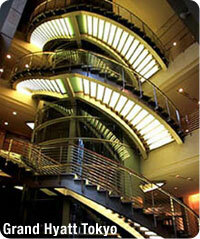 Slide real estate is limited as it is, why clutter it with logos and trademarks, footers, and so on? I don't know if the visual clutter found in many TV news broadcasts is a cause or just a symptom of a decline in visual literacy in combination with shorter attention spans. But one thing is for certain: if you want people to hear and understand your message the answer is not to add more clutter but to remove it all. As Lewis Black says, "Get that %$#@! off the screen!"